The official name of the sweeping healthcare reform bill is the Patient Protection and Affordable Care Act (Public Law 111–148). It passed the House of Congress narrowly, by a vote of 220 – 215. It was signed into law on March 23, 2010 by President Obama. We unaffectionately call it “Obamacare” because of the ruthless energy the president used to get it passed, including not giving members of Congress the opportunity to read it. He called Democrats into closed quarters and despite not having enough votes beforehand, magically he was able to convince them to switch their loyalty from the People to the Government. Not a single Republican voted for the bill, and 39 Democrats refused to vote for it as well. Imagine the breach of confidence those Democrats committed when they voted for the bill without even knowing what they were imposing on the American people. When we learned about the healthcare plan, we understood that it was going to make healthcare available to 32 million Americans who currently are uninsured. We were told that for those of us who already had insurance, either through our employer or a private plan, or through Medicaid or Medicare, we would be able to keep it. For those who don’t have insurance or have been denied insurance because of a pre-existing condition, however, they would be able to obtain coverage either through a state-based insurance exchange system (including an expanded Medicaid program) or under newly-expanded Medicare guidelines. Those with pre-existing conditions would not be penalized for those conditions and would be able to purchase insurance at the same rate as those healthier individuals. What we didn’t know was that by 2014, every citizen would be forced to purchase insurance or be penalized. What we didn’t know was that up to 16,000 new IRS agents would be hired under the bill to go after those who didn’t purchase insurance and to have direct access to their bank accounts. What we didn’t know was that healthy young men and women would be forced to purchase insurance for the sole purpose of paying for other’s coverage. What we didn’t know that the bill was full of new taxes and penalties. I’ve never heard someone interpret any of our founding documents so broadly. Rep. Candice Miller (R-Mich) admonished the Democrats for being so intent on passing a “jobs-killing, tax-hiking, deficit-exploding bill.” She said: “We are going to have a complete government takeover of our health care system faster than you can say, ‘This is making me sick’.” Obviously she knew more than most of the other Congressmen knew. So, in spite of what President Obama promised, we has gifted us the largest middle-class tax hike in history. Which brings us to the healthcare decision…. The bottom line is that we are stuck with Obamacare. The Supreme Court handed down that sentence on June 28 of this year in a decision I like to call “Supreme Nonsense.” As we all may recall, 26 states joined together in a lawsuit right after the healthcare bill was enacted (titled Florida v. Sibelius) and challenged the Individual Mandate under the Commerce Clause (the very basis the Congress gave for its authority to legislate) and the Medicaid expansion provision under the Tenth Amendment (claiming that it coerced, or forced, the states into doing something on behalf of the government). Without the Individual Mandate, the states argued that the bill must fail in its entirety for it is that provision that requires the coverage and which is the primary source of funding. Without the mandate, the stated goals of the bill are defeated. First, the Chief Justice voted with his four conservative colleagues in concluding that the Individual Mandate violated the Commerce Clause. They defined the scope of the Commerce Clause and established a “bright line” rule to guide future federal intrusion into the personal lives of Americans. On a positive note, this decision will restrict American Presidents and future Congresses for a generation and more. Furthermore, the Chief Justice agreed with the states that the Medicaid expansion program violated the Tenth Amendment (states’ rights) and impermissibly coerced them and their resources. But the decision didn’t end there, unfortunately. Again, the bottom line is that Obamacare survived judicial scrutiny, whether legitimately or under a flawed application of constitutional interpretation. The Individual Mandate, as both a premium and a penalty, is a tax. Obamacare is paid for by a tax, and in fact, many additional new taxes. But the tax is not uniform. The Obamacare tax does not apply to those who presently are untaxed, and it will not apply to the more wealthy, who will be excused because they carry health insurance anyway. So the tax will fall to the middle-class and in fact, the healthcare bill imposes the biggest tax on the middle-class in the entire history of the United States. (And that doesn’t even factor in all the other taxes included in Obamacare). [Consider that the median US family income is about $50,000. Family health coverage can easily run $20,000 a year, to increase sharply year after year. In this scenario, the coverage mandate is essentially a 40% tax on that family, which is now required by law to ensure that every family member has qualifying coverage. ($20,000 is 40% of $50,000). Because the cost of the coverage will be similar even though incomes vary significantly, the lower the income the higher the effective tax rate, thereby making the tax the most regressive tax in US history, as well]. The most offensive parts of the healthcare bill, as addressed above, are the Individual Mandate, the Medicaid expansion provision, and the series of taxes that will be levied one on top of another, and to be applied stepwise in the next ten years, as a means to pay for the plan. There are at least 21 new taxes embedded in the bill. Obama pulled the old “bait and switch,” which is defined as “an illegal tactic in which a seller advertises one product with the intention of persuading customers to purchase a more expensive product.” He sold us on a product that would cost us one price and impose little burden on the middle-class when in fact, the product comes at a much higher price and at a much greater consequence (to liberty). Simply put, the government is going to take a lot more money from the people who earn it — mostly from wealthier Americans who as I explained above, will most likely not even feel it (although $250,000 doesn’t really get you much these days, especially if you live in parts of the northeast, Florida, California, and Arizona) and from most small businesses who will most certainly feel it. It will result in those businesses hiring fewer people, laying off more employees, cutting hours, closing facilities, and thus increasing already high unemployment. The healthcare decision was most unfortunate and has put the new demons over the American people. Many people have a basic idea of what Obamacare does. Because the bill was so unwieldy and complicated, many are only now discovering many of its details and implications. You can hide a lot of needles inside a haystack that contains 2,700 pages. Three of those needles included the Individual Mandate (an act of coercion by the federal government), the Independent Advisory Payment Board (IPAB, also known as the “death panels”), and the Medicaid expansion program which will put an enormous burden on the states. I’ll discuss them in more detail. We now know that Obamacare will be the largest tax increase on the middle class in US history. It is already chilling job creation because employers are afraid of what will come down the pipes with Obamacare, and it will KILL any new jobs because of the massive increase in taxes on those who earn over $250,000. As you know, most small business owners organize as an LLC or an association, which means they file as an “individual” under the tax code. And most small business owners are able to classify as earning over $250,000. So they will be hit the hardest by Obamacare, as well as by Obama’s plans to increase taxes on that group if he is re-elected. They will not be able to absorb all the new taxes and still be able to invest in expanding their business, especially when it means they will have to pay healthcare benefits for all new employees (in addition to those they already employ). — That same day, Darden Restaurants announced that it will cut worker hours to part-time in order to meet the rising healthcare costs imposed by Obamacare. Darden Restaurants includes chains such as McDonalds, White Castle, Ruby Tuesdays, Jack-in-the-Box, and many others. Darden has been providing healthcare benefits to its part-time employees which it thought was more than fair, but now under the healthcare bill, which is inflexible on this matter, employees who work 30 hours or more must be provided the same all-inclusive plan that full-time employees receive. Furthermore, companies that do not comply will be penalized. So Darden is going to respond by cutting all non full-time employees down to under 30 hours. [Note that these restaurants, along with Unions, were granted waivers from Obamacare, but they were only temporary. They were 1-year waivers in order to give these organizations time to figure out how to adapt. And now we know… They are going to cut worker hours]. Parts of Obamacare have already affected you or someone you know, and the economy has already been affected. We hear so much about the depressed jobs numbers. How many jobs could be created today if businesses, especially small businesses, didn’t have to worry about how Obamacare will negatively impact them? We can only imagine how many jobs are instantly able to be created if we only had an administration that wasn’t intent on punishing business in order to establish a socialist scheme. We already have the highest business tax in the entire world. If Mitt Romney is elected, he has promised to repeal Obamacare on his first day in office. I predict that we will immediately see an increase in job creation and an improvement in our economy. As Paul Ryan and Mitt Romney understand, the economy depends on production and that means jobs. The biggest driver of revenue to the federal government isn’t higher tax rates…. it’s economic growth. Growth is the key to fiscal sustainability. And low tax rates are the key to growth. We can never hope to lower taxes if Obamacare is implemented. 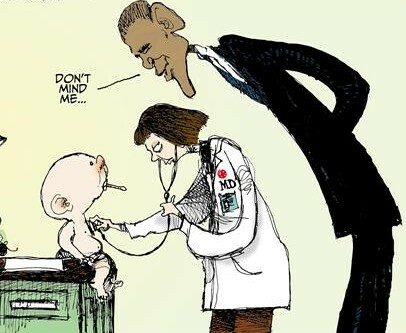 If Obama is re-elected, we can hope to repeal it, but he will never sign it. That will require a supermajority. And we will only have a supermajority if a whole lot more Republicans are elected into both houses of Congress, especially the Senate. We can also look into defunding it. Obamacare was intended and designed to withstand attempts by Republicans to make it go away. We saw how easily the Supreme Court was able to convert the Individual Mandate “penalty” into a “tax.” We are seeing how the plan goes into effect piece by piece, to be fully implemented by 2014 but still requiring further appropriations into 2019. The massive 2,700-page health care law is deliberately designed to make defunding and dismantling difficult. Dismantling will be difficult because Obamacare has created so many new governmental agencies. Although original estimates reported that it created 159 new government agencies, the Congressional Research Service later concluded that the actual number of new agencies, boards, etc., “is currently unknowable,” because so many of them are empowered to spawn additional entities, just as weeds grow by sending out runners and seeds. Defunding will be particularly tricky because the law is designed to be difficult to uproot, just like a plant with an elaborate root system. How does the healthcare bill frustrate efforts by Congress to defund the bill? — First, approximately $120 billion in funding appropriations were included in the bill which Obama signed. Appropriations were made immediately. This violates the typical Congressional process of appropriations. The normal process typically involves enacting authorization bills that authorize spending, and then follows those with separate legislation that actually appropriates the money. — Second, by making advance appropriations for tens of billions of dollars up to the year 2019, these provisions of Obamacare seek to remove spending decisions from the reach of the current Congress and from future Congresses and Presidents. Although Obamacare was not pitched to the public as a mandatory spending entitlement, the details of the legislation reveal an intent to block any future Congress from controlling spending on Obamacare. — To defund Obamacare, it is insufficient simply to deny future funding. Until the full law can be repealed, at least the existing and advance appropriations need to be rescinded, just as the House voted last year to repeal billions of dollars from previous appropriations to 123 federal programs. Unfortunately this vote was void because of a parliamentary procedure violation. That was most unfortunate. — With the healthcare bill, the Congressional Democrats sought to bind future Congresses to spending obligations with Obamacare – for a full decade in advance. This is an outrageous effort. It may not be unconstitutional per se, but in a system that gives citizens the right to have input in the affairs of Congress thru the ballot box, spending decisions should be made by those who currently hold office, not by those who have resigned or been turned out by the voters. What are some efforts so far to make Obamacare go away? Eric Cantor introduced H.R. 2 – “Repeal of the Job-Killing Health Care Law Act” – in the US House where it passed on January 19, 2011. The Act simply states: “The Act is repealed, and the provisions of law amended or repealed by such Act are restored or revived as if such Act had not been enacted.” H.R. 2 was sent to the Senate where it was put on the calendar but it still has not been allowed to come up for a vote. Also, on July 9th of this year, Congress introduced H.R. 6088 – “Total Repeal of the Unfair Taxes on Healthcare Act” – which would amend the tax code to repeal certain tax increases enacted as part of health care reform. The Act is still in committee. The healthcare bill can go away if: (i) Congress repeals it (see H.R. 2); (ii) Congress disapproves it under the Congressional Review Act of 1996; (iii) Congress defunds it; (iv) the Supreme Court reverses its opinion; or (v) the States nullify it and are willing to interpose on behalf of their citizens. I will discuss this last option at the end. 2). So far, over $105 billion has been appropriated to fund Obamacare, not including the $760 billion stolen from Medicare. This program is not going to help the economy; it’s going to hurt it. Government spending will be uncontrollable. 3). Under the law, most individuals who can afford it will be required to obtain basic health insurance coverage or pay a fee (termed a “penalty” in the healthcare bill) to help offset the costs of caring for uninsured Americans. This is the notorious Individual Mandate (Section 5000). In other words, everyone must purchase private health insurance or pay a fine. This is the cornerstone of the healthcare reform bill. As Justice Kennedy emphasized at oral arguments, he was very concerned about the status of young people with respect to the healthcare bill. He noted that the government wasn’t exactly been honest about its intentions with the bill, which was to find a way to offset the burden that uninsured individuals place on healthcare. Kennedy said that if the administration was really interested in preventing young people (many who are uninsured) from being such a burden, the healthcare plan would allow them to buy only catastrophic health insurance (instead of the plan that includes well visits, preventative care). Catastrophic health insurance is all that 20-30 year-olds really need; It’s the only product that makes any economic sense for them. But Obamacare doesn’t allow that. So, as Kennedy emphasized, we see what the healthcare bill is really all about. It’s about using 20-30 year-olds to subsidize the plan, to subsidize insurance for those who can’t afford it. It’s about using young healthy people to fund the program. It’s about a social scheme. And now we know… the government’s plan is to subsidize health insurance for everyone, especially those who are uninsured and sick (approximately 20% of all uninsured). The plan forces insurance companies to cover the sick. But it doesn’t want to use the typical means to pay for this – such as tax subsidies. Instead, the government wants to reach OUTSIDE the market and COMPEL a whole bunch of healthy people into that market so they can be used to subsidize the program and help bring healthcare premiums down. In fact, this was the finding by Congress: that bringing young healthy people into the market will bring down the health insurance premium by about 15% for everyone. Unfortunately, though, it will force them to buy something they don’t need or want. This provision kicks in in 2014. By 2014, most citizens and legal residents must carry an expensive health insurance or pay a penalty. 4). A small number of Americans will be exempt from the tax. Those exempted include: (i) people with religious objections; (ii) American Indians with coverage through the Indian Health Service; (iii) undocumented immigrants; (iv) those without coverage for less than three months; (v) those serving prison sentences; (vi) those whose income is below the poverty level. This list of exemptions provides for abuse and group exemptions for certain religious groups. (i) The Medical Device Manufacturing Tax (a 2.3% tax on medical device makers which will raise the price of every pacemaker, prosthetic limb, stent, operating table, and much more. Most of the manufacturers are small companies). (ii) The High Medical Bills Tax – This onerous tax provision will hit Americans who face the highest out-of-pocket medical bills. Currently, Americans are allowed to deduct medical expenses on their 1040 form to the extent the costs exceed 7.5% of one’s adjusted gross income. The new ObamaCare provision will raise that threshold to 10%, subjecting patients to a higher tax bill. This tax will hit pre-retirement seniors the hardest. Over the next ten years, affected Americans will pony up a minimum total of $15 billion in taxes thanks to this provision. (iii) Flexible Spending Account Cap – The 24 million Americans who have Flexible Spending Accounts will face a new federally imposed $2,500 annual cap. These pre-tax accounts, which currently have no federal limit, are used to purchase everything from contact lenses to children’s braces. With the cost of braces being as high as $7,200, this tax provision will play an unwelcome role in everyday kitchen-table health care decisions. The cap will also affect families with special-needs children, whose tuition can be covered using Flexible Spending Account funds. Special-needs tuition can cost up to $14,000 per child per year. This cruel tax provision will limit the options available to such families, all so that the federal government can squeeze an additional $13 billion out of taxpayer pockets over the next ten years. The targeting of Flexible Spending Accounts by President Obama and congressional Democrats is no accident. The progressive left has never been fond of the consumer-driven accounts, which serve as a small roadblock in their long-term drive for a one-size-fits-all government health care bureaucracy. At this point already, under Obamacare, families cannot use these accounts to pay for over-the-counter medication. (iv) Surtax on Investment Income – Under current law, the capital gains tax rate for all Americans rises from 15 to 20% in 2013, while the top dividend rate rises from 15 to 39.6%. The new Obamacare surtax takes the top capital gains rate to 23.8% and top dividend rate to 43.4%. The tax will take a minimum of $123 billion out of taxpayer pockets over the next ten years. This new tax will hit capital gains, dividends, rents, and royalties, discouraging investment and harming economic growth. (v) Medicare Payroll Tax increase – In 2013, the employee portion of the Medicare payroll tax will increase from 1.45 to 2.35% for families earning $250,000 or more and individuals earning $200,000 or more. The income threshold is not indexed for inflation, so more and more middle-income families will be hit by the tax hike as time goes on. This tax soaks employers to the tune of $86 billion over the next ten years. Another provision, as emphasized in the Ryan plan, is a 3.8% Medicare tax on unearned income of “high-income” taxpayers which could apply to proceeds from the sale of single family homes, townhouses, co-ops, condominiums, and even rental income, depending on your individual circumstances and any capital gains tax exclusions. This 3.8% tax on home sales and unearned income will raise more than $124 billion to pay for Obamacare. As you can understand, there is a reason why the authors of Obamacare wrote the law in such a way that the most brutal tax increases take effect conveniently after the 2012 election. It’s the same reason that the bill was pushed thru Congress before anyone had a chance to read it. It’s the same reason that members of Congress (and I’m sure President Obama himself) exempted themselves from it. And it’s the same President Obama, congressional Democrats, and the mainstream media conveniently neglect to mention these taxes. 6). You’ve probably all heard that Obama raided $760 billion dollars from Medicare to pay for Obamacare. But what we didn’t find out until later is that he has no plan to pay that money back. The embedded taxes in Obamacare for Medicare, from what I understand, are to provide for the vast numbers of seniors who will be on the program in the coming years and to provide them with more preventative benefits and coverage. (but not for greater care for major illness). In fact, over-all, Obamacare will reduce the amount of future spending growth in Medicare thru the IPAB. So while more seniors will be on Medicare, spending will not increase accordingly. 7). Medical records will be centralized with the government – in a national database. Put in other terms, the government will have the ability to seize your medical records. In order to make information more readily available for doctors during their appointments, the government intends to create a national database containing every person’s medical history. [This is potentially a violation of the 4th and 5th Amendments – a seizure of a person’s privacy, as well as a taking of private property]. People are the owners of their medical records, and the doctors are their custodians. With the creation of such a database, healthcare decisions will be dictated by government bureaucrats and NOT the doctor or patient. 8). Perhaps the most offensive part of the bill is the Independent Payment Advisory Board (IPAB) – a 15-member panel of bureaucrats tasked with finding ways to cut Medicare spending (that is, it’s role is to ration care in order to keep the costs of the program contained). It is also called the “death panel.” It will take effect in 2014, although there is talk that Obama will try to have it take effect earlier. By law, no more than 7 of the members can be physicians. Board members are appointed by the President and confirmed by the Senate. Its decisions cannot be easily challenged. In order to override IPAB’s proposal, opponents must assemble a simple majority in the House and then a three-fifths majority in the Senate and finally, the president’s signature. That makes IPAB more than an advisory board. It’s a super-legislature whose members are more powerful than members of Congress As one leading challenger of the bill has said: “The IPAB is ‘independent’ in the worst sense of the word: it is independent of Congress, the President, the judiciary and the American people. The IPAB is a death panel not only by virtue of its awesome powers to control health-care decisions for millions of Americans, but because its creation and existence are antithetical to our republican form of government and the freedoms it was designed to protect. Here is another bit of info about the IPAB… It appears that in order to repeal the IPAB, a repeal bill MUST be passed by 2017; otherwise we are stuck with it. Furthermore, to pass the repeal, there must be a 3/5 supermajority…… and then even after that vote, it would – by law, continue at least until 2020. [IPAB – See Sections 3403 and 10320] In fact the House has already voted to repeal the IPAB, but the Senate, under Harry Reid, will not take up the measure. 9). Illegal immigrants are not covered by Obamacare. So they will still be able to receive healthcare, mostly by going to the emergency room, and continue to burden the healthcare system so that costs and prices will continue to go up. The burden of Illegal immigrants on the healthcare system was one of the very drivers of its cost increases. 10). Parents of dependent children will be required to keep their adult children on their policies until age 26. One of the provisions in Obamacare is a requirement that group health plans that provide dependent coverage of children make that coverage available until age 26. Will this provision can be considered a good one to some, there are many parents that look forward to the day that their children become adults so that they can wean themselves from supporting them. Provisions like this will be seen as a burden by couples who work and can afford health insurance. When deciding how many children to have, this provision will have to be something they need to consider, in addition to college tuition, etc, etc. Those who can’t afford the premiums and are supplemented by the government can, once again, reproduce without responsibility. (i) It penalizes marriage. Obamacare creates new taxpayer-funded subsidies for the low and middle classes to purchase health coverage, but the structure of the subsidies allows two individuals to claim more in subsidies alone than if married. This discriminates against married couples and discourages marriage at almost all age and income levels. (ii) It violates religious liberty. We’ve all heard of the Contraceptive Mandate. Churches are in an uproar over this. The Department of Health and Human Services included the full range of contraceptives, including abortion-inducing drugs, among the women-specific preventive services that Obamacare requires insurers to include with no cost-sharing. This mandate violates Americans’ conscience rights and religious liberty. Its narrow exemption for religious employers will force many who find these products morally objectionable—including religious charities, hospitals, and schools—to pay for them. (iii) It puts over half of all Americans on a government program. Because of Obamacare’s huge expansion of Medicaid and creation of taxpayer-funded subsidies to purchase health coverage, more than half of all Americans will be dependent on a government health care program (Medicare, Medicaid, or the government exchanges) by the end of this decade. (i) The U.S. Postal Service was established in 1775 – they’ve had 234 years to get it right; it is broke, and even though heavily subsidized, it can’t compete with private sector FedExp and UPS services. The U.S. Postal Service will lose over $7 billion this year and will require yet another “bailout.” [The Postal Service is a CONSTITUTIONAL obligation; Healthcare is NOT). (ii) Social Security was established in 1935 – they’ve had 74 years to get it right; it is broke. There is nothing in the Social Security Trust Fund except IOUs from the government. (iii) Fannie Mae was established in 1938 – they’ve had 71 years to get it right; it is broke. Freddie Mac was established in 1970 – they’ve had 39 years to get it right; it is broke. Together Fannie and Freddie have now led the entire world into the worst economic collapse in 80 years. (iv) The War on Poverty was started in 1964 – they’ve had 45 years to get it right; $1 trillion of our hard earned money is confiscated each year and transferred to “the poor”; it hasn’t worked. (v) Medicare and Medicaid were established in 1965 – they’ve had 44 years to get it right; they are both broke; and now our government dares to mention them as models for all US health care. (vi) AMTRAK was established in 1970 – they’ve had 39 years to get it right; last year they bailed it out as it continues to run at a loss! (vii) In 2009, a trillion dollars was committed in the massive political payoff called the Stimulus Bill. It shows NO sign of working; it’s been used to increase the size of governments across America, and raise government salaries while the rest of us suffer from economic hardships. It has yet to create a single new private sector job. Our national debt projections (approaching $10 trillion) have increased 400% in the last six months. (viii) “Cash for Clunkers” was established in 2009 and went broke in 2009 – after 80% of the cars purchased turned out to be produced by foreign companies, and dealers nationwide are buried under bureaucratic paperwork demanded by a government that is not yet paying them what was promised. With a perfect 100% failure rate and a record that proves that each and every “service” shoved down our throats by an over-reaching government turns into disaster, how could any informed American trust our government to run or even set policies for America’s health care system, which is over 17% of our economy? 15). Obamacare only achieves its goals if: (i) everyone is forced to participate and those that can pay do pay; and (ii) the states provide Medicaid expansion to get as many people signed up and on the program as possible. The goal of course is to provide affordable care to everyone and to keep costs contained over the course of the program. Hence, the title of the bill. With the Supreme Court’s decision, however, states are no longer mandated to add people to Medicaid. They have the option of opting out of the expansion provision and therefore do not have to set up the exchanges. In fact, several states have been adamant about not creating the health care exchanges, namely Texas, Louisiana, Michigan, South Carolina, and Florida. New Jersey Governor Chris Christie vetoed setting up an exchange in his state in May of this year, and Governor John Lynch of New Hampshire (a Democrat) also vetoed the initiative in his state. The question is this: If enough states opt out, will the goals of the bill be frustrated to the point that universal healthcare will not be viable as a government entitlement program because of the increased costs that will result? 16). If Obama is re-elected, the fear – or, the likely reality – is that we are stuck with Obamacare. By extension – because of its chilling effect on the economy, the new norm here in the United States might be 8%-9% unemployment (most of it part-time with no benefits) and most people living on the government dole. The question is where will the money continue to come from? The average American would love to believe that as long as he or she isn’t annoying anyone or isn’t infringing on anyone’s legitimate rights, he or she should be left alone to enjoy his life and property — to pursue happiness. But there are too many government regulatory agencies to allow that to be true. This is not a nation where people are left alone anymore. This is a nation where they are hounded from the moment they are born until the moment they die by the arms of a regulatory state run by men and women weaned on the ideology of big government, socialism, and the idea that the government’s job is to protect our green planet and to promote the greatest benefit to the greatest number of people). Sadly, this is a nation, founded on the inherent power of the individual over his life, liberty, and property, where just being left alone is the greatest of luxuries. All of this begs the bigger question: What has become of our Inalienable Rights? Government has strayed away from its intended purpose. All levels of government have abused their powers. The federal government is no longer constrained by the document that alone gives it permission and limits on what it can legally do — that is our Constitution. It no longer protects our Life, Liberty, and Property. It attacks our Life with the Obamacare. It attacks our Liberty with the Patriot Act, the National Defense Authorization Act, and even the TSA at our airports. And it attacks our Property with the federal income tax system and Agenda 21. The government’s evil, liberty-killing scheme is funded by the power of plunder that was granted it under the 16th Amendment. The government plunders our very natural human resources — our Property…. the fruit and improvements of our property, the products of our labor, and the creations of our mind. But then again, a government that can create economic stress is in a good position to constrain our liberties. A hungry man thinks about food, not freedom. Finally, I don’t like the notion of a planned society. We’ve seen how many of them have ended – Nazi Germany, Communist Russia, Communist China, Pol Pot’s Cambodia, Kim Jung Il’s North Korea, to name a few. Obamacare puts our lives under the power of bureaucrats and experts. They claim to be experts, but in what field. One such “expert” who helped craft the IPAB (“death panel”) is an expert in cost effectiveness. Ezekiel Immanuel. He has a cold inhuman approach to healthcare. I don’t trust when government gets involved in questions that talk about what is good for man, and what justice should be. I don’t trust when government enters those debates that talk about what things are worth having at what price and who should have them. And I certainly don’t trust when government gives an opinion on the value of life. I saw what they did with the unborn in Roe v. Wade. A decision that asks whether a person’s life is worth living on certain terms (as with an unfortunate diagnosis), is a decision that should be left to that person alone and according to the God-given right of self-preservation, he should be entitled to pursue whatever medical options he can. Finally, I don’t like a program that demands my obedience to government or be penalized for it. That was Nazi Germany. The US republic is unique. Government can pass no law or take no action unless the authority for such law or action is specifically granted in the Constitution. That is the essence of our limited government. It is also the understanding of the states when they signed the Constitution (a compact, or contract) and formed the American Union. What happens when the government oversteps its constitutional powers? Well, initially we are instructed to let our constitutional system play out since our government has a clear separation of powers in its three branches and is designed with a series of checks and balances. Each of the branches is expected to act as a jealous guardian of its powers and responsibilities so that no other branch tries to intrude on the others. Since the states can no longer control the Congress from within, as the Constitution originally provided in Article I, Section 3 by appointing Senators (“The Senate of the United States shall be composed of two Senators from each State, chosen by the Legislature thereof…”), it’s most effective, and “rightful,” remedy is Nullification and Interposition. The answer is Nullification. This is the doctrine articulated by Thomas Jefferson which states that the Constitution, by word and by creation, empowers states to nullify laws passed by Congress. That is, it allows states to decide when laws passed by Congress have exceeded the powers granted by the Constitution and to rightfully declare that they are null and void and therefore unenforceable. The Constitution, through the Supremacy Clause of the Sixth Amendment, acknowledges the residuary sovereign powers that reside with the states to govern themselves and their citizens. Our system of federalism (embodied in the Tenth Amendment) empowers the States to stand up to the federal government. And the compact nature of our Constitution gives the States the legal authority. The states, as the parties to the Constitution, are the ones who rightfully can reign in the government in its application of that document. The States, as creators of the federal government, have the final authority to determine the limits of the power of that government. Under this compact theory, the States and not the federal courts are the ultimate interpreters of the extent of the federal government’s power. In other words, the states are the rightful parties who can enforce the Constitution. As the Constitution’s absolute sovereign creator, the People are not – and were never intended to be – subordinate to their creation, the federal government. The government was created as an agent, to both the States and the People. The people have final authority. An agent serves its master and never the other way around. The Constitution is merely “a description, (or memorialization), of those powers which the people have ultimately delegated to their Magistrates, to be exercised for definite purposes.” The people therefore, according to Madison, are entitled to interposition by their State governments when their agent, the federal government, fails to conform with constitutional dictates. [Note: To make clear – the States spoke for the People through the State Conventions which were selected by the People]. Thomas Jefferson and James Madison were enraged when the Alien and Sedition Acts were enacted in 1796 in response to the Quasi War with France. The Acts were designed to round up and deport aliens that the government deemed problematic and to detain and imprison those who dared to criticize, disparage, and malign members of the government (except the VP, who just happened to be Jefferson at the time!!) either in word or in print. They believed the laws were unconstitutional. Jefferson complained to Madison that both acts showed “no respect” for the Constitution. Madison called the Alien Act “a monster” that would “forever disgrace its parents,” the Founders that demanded a limited government and a Bill of Rights. The two men corresponded about what remedy should be taken in response. They didn’t trust the judicial review process for the Court at the time was dominated with Federalists, and it was the Federalists in Congress who passed the laws and it was the Federalist president, John Adams, who signed them into law and who didn’t believe they offended the Constitution. In general, they didn’t trust the Supreme Court to be the ultimate interpreter of the Constitution. They also understood that an oppressive government would lead states or even parts of states to secede and that was an extreme situation that should be avoided as aggressively as possible. They concluded that it was up to the states to declare when acts of the government exceeded constitutional authority and then to declare them null and void. And so they came up with their doctrines of nullification and interposition. The Alien and Sedition Acts prompted Madison and Jefferson to organize protests. They did so by drafting a series of resolutions that would be adopted by the legislatures of Virginia and Kentucky to pronounce the unconstitutionality of the Acts. The resolutions that Madison authored were adopted in 1798 by the Virginia legislature and became the Virginia Resolves, while the resolutions that were drafted by Jefferson drafted were eventually adopted in modified form by the Kentucky legislature. (The Kentucky Resolves of 1798; another set of resolutions were adopted in 1799). In passing the resolutions, both legislatures expressed the judgment that the two federal laws were unconstitutional. The Kentucky Resolves stated that its purpose was to protest the Acts while the Virginia Resolves were more forceful. It declared that “necessary and proper measures will be taken” to maintain the authorities, rights, and liberties” of the States and the people and then appealed to the other states to join in the protest. The governor of Virginia was instructed to transmit copies of the Resolves to the other state legislatures in the hope that those bodies would adopt similar measures. The Kentucky and Virginia resolutions highlight a grave flaw in the Constitution of 1787: the states did not explicitly provide or designate an umpire to settle disputes between the states and the central government. The Constitution is quiet on that subject. The Federalist Papers, the ultimate authority on the meaning and intent of the Constitution, only gives the Supreme Court the power to offer an “opinion” to the other branches and no binding authority. [Federalist No. 78 says the federal Judiciary “has no influence over either the SWORD or the PURSE (executive or legislative branches) …. It may truly be said to have neither FORCE nor WILL, but merely judgment.”]. It was the Supreme Court itself which redefined its powers in Marbury v. Madison (1803), vaulting its status to the final arbiter of the meaning and intent of the Constitution. If the Supreme Court is to remain the unchallenged ultimate arbiter of the Constitution, as the Court unanimously proclaimed in Cooper v. Aaron (358 U.S. 1 ), then the caprice of the national government and not the Constitution is the supreme law of the land. Clearly, if the national government is the judge of its own powers, it will construe them broadly and dispose of any hopes for limited government. Jefferson warned in very strong terms that the federal judiciary is not to be trusted. He inferred that in the absence of a designated umpire, the parties to the compact are the ultimate arbiters of the Constitution. His reasoning is sound and needs to be re-asserted, just as states are now re-asserting the doctrines of Nullification and Interposition. We arguably have an unconstitutional law with Obamacare. Arguably, the government has overstepped its constitutional powers. It has over-stepped its bounds as a government of limited powers and one obligated to protect our Life, Liberty, and Property and not to attack those precious liberties. It simply doesn’t have the authority to legislate for healthcare. That is a state function, under its state police powers (to regulate for the health, safety, welfare, and morality of its people). It is the same argument that Jefferson and Madison made with the Alien Act of 1796. Congress didn’t have the constitutional authority to pass such legislation. Now, there may be some who will say that the government can use its taxing/spending powers to regulate for the “general welfare,” but read further for my argument on the taxing power. Additionally, the “general welfare” clause refers to the people of the United States, in general, and not just certain groups of people. Everyone must be served, equally. With Obamacare, the poor and other uninsured are served. A 2011 census showed that 15% of Americans are living in poverty. There are additional people who are uninsured because they have been denied on account of pre-existing conditions. These people will benefit from Obamacare. But the young, healthy people forced into the system for no other reason than to provide the ‘tax’ revenue to support health insurance and care for the uninsured are not receiving a benefit but rather, a burden. The government is plundering their property. (i) First, did the Separation of Powers stop the bad bill? No, it didn’t. President Obama, head of the Executive branch, should not have signed the bill, passed by the Legislative branch, into law. (ii) Did the people contact their representatives and did Congress respond to the peoples’ wishes by repealing the bad bill? No, they did not. A gallop poll in February of this year showed that 72% of all Americans (including 56% of Democrats) believe the Individual Mandate is unconstitutional and want it struck down or repealed. These polls are no secret to members of Congress. Letters and calls are delivered constantly and protests have been held in Washington DC. Yet the House and the Senate (especially the Senate) has remained firm on the bill. Congress intends for it to stand. (iii) Third, did the Supreme Court strike the unlawful bill down? No, it didn’t. (iv) Can the people fix the problem at the ballot box? That is still yet to be seen. Will this year’s voters retire those representatives who have violated their oaths and failed to tie legislation to a legitimate source of constitutional authority? Will the new Congress repeal the bad bill? Obamacare must be stopped. Government must be stopped. The unstoppable growth of government must be stopped. Obamacare will lead to an unprecedented growth in the number of agencies it will require to implement the program and then, perhaps, even incidental programs to keep people from needing healthcare. If President Obama is re-elected, or if Mitt Romney is elected and fails to repeal Obamacare, then the States must be prepared and willing to use Nullification and Interposition in order to protect the liberties of the American people which are secure only as long as the Constitution is faithfully adhered to. Just like the early Americans who supported the unconstitutional acts of the Federalists, such as the Alien and Sedition Acts, and did not question them, modern Americans have been dupes in forging their own chains. The chains have gotten stronger and have been fastened tighter. We are on the verge of losing the precious liberties and safeguards we were blessed with by our divinely-inspired Founders. We need a revival of the Spirit of 1776. We need to recapture the constitutional urgency that men like Jefferson and Madison felt in 1798 and 1800. And then we need to promote Nullification as never before and if need be, declare Obamacare null and void and make sure it is unenforceable upon the American people. If anyone would like to support the Nullify Obamacare movement, please sign the petition with your state Tenth Amendment Center. The 17th Amendment repealed Article I, Section 3 which provided that Senators would be appointed by the state legislatures and provided that they would be elected by the people. Pg 22 mandates that the Government will audit books of ALL EMPLOYERS that self insure. So every employer in the United States will be subjected to a health insurance audit just as all taxpayers are subject to audit. Of course, we will have to pay for an entire new bureaucracy to do this–the Internal Health Revenue Service? Pg 42 recognizes the power of the Health Choices Commissioner to determine your health benefits. You will have no choice. Pg 50, section 152 states that free, taxpayer-paid health care will be given to the 30 million non-citizens in the USA, even illegal aliens. Pg 30, Sec 123 states that there will be a government committee that decides what treatments you are allowed and what your overall benefits are. Pg 29, lines 4-16 basically mandates the rationing of health care as is being done in Canada. Pg 58 states that government will have possession of all your health care records & history including finances and you will have to have a National ID Healthcard. Pg 59, lines 21-24 gives direct access to your banks accounts to compel you to pay any out-of-pocket or premium costs electronically without your previous consent. Pg 72, lines 8-14 creates a Health Care Exchange to bring private health insurance plans under government control. This part of the bill reveals Obama’s lies about being able to keep your plan if you like it. Any health insurance plan which does not completely rework itself to conform to these regulations will be dropped from the exchange and those insured will have to pick one of the plans in the exchange. This is why the Congressional Budget Office determined that over 20 million will lose the coverage they are now enjoying if Obamacare is implemented. Pg 145, line 15-17 any employer not currently insuring their employees must enroll employees into public plan option, with no choice of private insurance allowed. Pg 126, lines 22-25 mandates that employers must pay for health insurance even for part-time workers and their families, which will certainly lead to massive layoffs. Pg 149, lines 16-24 all employers with an annual payroll bigger than $400k who does not pay to enroll employees in public insurance option will pay an 8% tax on all payroll. Pg 167, lines 18-23 any individual who is self-employed and does not have health insurance will be taxed 2.5% of income and forced to accept public health insurance. So paying for health care out of pocket will be banned from the face of the earth. Pg 65, sec 164 provides for a political payoff from the Democrats and Obama; a special subsidized plan for retirees and their families in unions community groups like ACORN. Pg 102, lines 12-18 mandates that all Medicaid eligible will be automatically enrolled in Medicaid based upon income and insurance status. No choice. Pg 124, lines 24-25 states that no private company or individual can have the right to sue the federal government for medical price fixing, basically eliminating your right to seek redress in the courts regarding your medical care. Pg 469 mandates “Community Based Home Medical Services” through non profits like ACORN. Happy yet that we elected a community organizer to the White House? Pg 85, line 7 provides specifics for benefit levels for all health plans, giving government the right to ration everyone’s healthcare. Pg 239, line 14-24 mandates that available physician services will be reduced for Medicaid recipients. Many poor people including many seniors will be affected. Pg 272, Sec. 1145 regulates the operation of certain types of cancer hospitals, again rationing the care of cancer patients. Pg 91, lines 4-7 mandates that doctor’s offices, clinics and hospitals provide language-appropriate services, basically ordering them to hire translators at the expense of the American taxpayer. Pg 95, lines 8-18 allows the government to hire non-profit community groups like ACORN and Americorps to sign up people for the government health plan. Pg 170, lines 1-3 exempts non-resident aliens from the individual health care taxes, so Americans citizens will pay for these aliens, legal and illegal alike. Pg 489, Sec 1308 force taxpayers to pay for Marriage & Family therapy under the public insurance plan. Pg 127, lines 1-16 dictates doctors’ payment and therefore income which will reduce what doctors earn and lead to greater shortages of doctors and more rationing of care. Pg 150, lines 9-13 mandates that employers with an annual payroll between $251K & $400K who does not pay to enroll employees in public insurance option will pay a 2-6% tax on all payroll. Pg 241, line 6-8 mandates that all doctors receive the same pay, regardless of specialty. This will vastly reduce the number of specialists available in the United States, a common problem where medicine is socialized like Canada. Pg 253, line 10-18 allows the federal government to set the value of doctor’s time, professional judgment. Pg 265, Sec 1131 mandates and controls the productivity of all health care providers including surgeons! Pg 280, Sec 1151 allows the government to penalize hospitals for what is deemed to be preventable re-admissions. So instead of being sued for malpractice, the government will be the punitive body when mistakes are made. Pg 298, lines 9-11 mandates that if a doctor treats a patient during initial admission and that result in a re-admission, the doctor will be subject to federal penalties. Gee do you think that’s going to drive up the cost of malpractice? Pg 317, lines 13-20 will create prohibitions on ownership and investment in the health service industry for doctors. Pg 317-318, lines 21-25, and 1-3 will prohibit the expansion of all hospitals. Pg 321, lines 2-13 allows hospitals apply for an exception to the expansion rule but they must seek community input first! Pg 335, lines 16-25, Pg 336-339 mandates the establishment of outcome based health care and insidious idea that actually limits the treatment choices made by patients with their doctors, based upon the patient’s health and condition. This will result in the oldest, weakest and sickest patients being denied treatments simply because the statistics for success in their demographic category are poor! This is a form of health care rationing that will save money at the expense of seniors to help buy insurance for the uninsured, most of whom are young and healthy! Pg 341, lines 3-9 allows the government to disqualify Medicare Advantage Plans and HMO forcing people into the government run public plan. Pg 195 officers & employees of the new Health Care Administration will have access to all Americans personal financial records and accounts. Pg 203, line 14-15 actually says that “The tax imposed under this section shall not be treated as tax.” Yes, it says that. Pg 268, Sec 1141 regulates the rental & purchase of power driven wheelchairs. Pg 379, Sec 1191 mandates the creation of even more bureaucracy in the Telehealth Advisory Committee. Pg 425, lines 4-12 mandates “Advance Care Planning Consultation,” another insidious vehicle to save money by encouraging seniors who are in poor health to be more accepting of death rather than fighting to stay alive and healthy and with their loved ones. Pg 425, lines 17-19 mandates that all senior patients will be consulted regarding living wills, durable powers of attorney. Pg 425, lines 22-25, 426 lines 1-3 provides an approved list of end of life resources, to help guide seniors about the process of dying! Pg 427, lines 15 mandates program for orders on the end of life, actually giving the government a say in how your life ends! Pg 429, lines 1-9 dictates the frequency with which an Advance Care Planning Consultant will have to meet with patients as their health deteriorates. Pg 429, lines 10-12 give an Advance Care Planning Consultant the power to order end of life plans for a patient. Pg 354, Sec 1177 will arbitrarily restrict the enrollment of special needs children and adults. Pg 429, lines 13-25 will only allow certain doctors, not necessarily your own physician, to write an end of life order. Pg 430, lines 11-15 allows the government to decide what level of treatment you will have at end of life. Pg 494-498 allows government to define mental illnesses and what services will be allowed to treat, again rationing this care. Obamacare was passed and signed into law on March 21, 2010. — PPACA includes numerous provisions to take effect over several years beginning in 2010. Policies issued before particular provisions take effect are grandfathered from many of these provisions, while other provisions may affect existing policies. — A shared responsibility requirement, commonly called an Individual Mandate, requires that all individuals not covered by an employer sponsored health plan, Medicaid, Medicare or other public insurance programs, purchase and comply with an approved private insurance policy or pay a penalty, unless the applicable individual is a member of a recognized religious sect exempted by the Internal Revenue Service, or waived in cases of financial hardship. — Health insurance exchanges will commence operation in each state, offering a marketplace where individuals and small businesses can compare policies and premiums, and buy insurance (with a government subsidy if eligible). — Low income individuals and families above 100% and up to 400% of the federal poverty level will receive federal subsidies on a sliding scale if they choose to purchase insurance via an exchange (those at 150% of the poverty level would be subsidized such that their premium cost would be 2% of income, or $50 per month for a family of four). — The text of the law expands Medicaid eligibility to include all individuals and families with incomes up to 133% of the poverty level, and simplifies the CHIP enrollment process. In National Federation of Independent Business v. Sebelius, the Supreme Court effectively allowed states to opt out of the Medicaid expansion, and some states have stated their intention to do so. In states that choose to reject the Medicaid expansion, individuals and families at or below 133% of the poverty line, but above their state’s existing Medicaid threshold, will not be eligible for coverage; additionally, subsidies are not available to those below 100% of the poverty line. As many states have eligibility thresholds significantly below 133% of the poverty line, and many do not provide any coverage for childless adults, this may create a coverage gap in those states. — Minimum standards for health insurance policies are to be established and annual and lifetime coverage caps will be banned. — Firms employing 50 or more people but not offering health insurance will also pay a shared responsibility requirement if the government has had to subsidize an employee’s health care. — Very small businesses will be able to get subsidies if they purchase insurance through an exchange. — Co-payments, co-insurance, and deductibles are to be eliminated for select health care insurance benefits considered to be part of an “essential benefits package” for Level A or Level B preventive care. The PPACA’s provisions are intended to be funded by a variety of taxes and offsets. Major sources of new revenue include a much-broadened Medicare tax on incomes over $200,000 and $250,000, for individual and joint filers respectively, an annual fee on insurance providers, and a 40% excise tax on “Cadillac” insurance policies. The income levels are not adjusted for inflation, with bracket creep eventually increasing taxes on middle incomes. There are also taxes on pharmaceuticals, high-cost diagnostic equipment, and a 10% federal sales tax on indoor tanning services. Offsets are from intended cost savings such as changes in the Medicare Advantage program relative to traditional Medicare. –> Original budget estimates included a provision to require information reporting on payments to corporations, which had been projected to raise $17 billion, but the provision was repealed. The PPACA is divided into 9 titles and contains provisions that became effective immediately, 90 days after enactment, and six months after enactment, as well as provisions phased in through to 2020. Below are some of the key provisions of PPACA. For simplicity, the amendments in the Health Care and Education Reconciliation Act of 2010 are integrated into this timeline. — The Food and Drug Administration is now authorized to approve generic versions of biologic drugs and grant biologics manufacturers 12 years of exclusive use before generics can be developed. — The Medicaid drug rebate (paid by drug manufacturers to the states) for brand name drugs is increased to 23.1% (except the rebate for clotting factors and drugs approved exclusively for pediatric use increases to 17.1%), and the rebate is extended to Medicaid managed care plans; the Medicaid rebate for non-innovator, multiple source drugs is increased to 13% of average manufacturer price. — A non-profit Patient-Centered Outcomes Research Institute is established, independent from government, to undertake comparative effectiveness research. This is charged with examining the “relative health outcomes, clinical effectiveness, and appropriateness” of different medical treatments by evaluating existing studies and conducting its own. Its 19-member board is to include patients, doctors, hospitals, drug makers, device manufacturers, insurers, payers, government officials and health experts. It will not have the power to mandate or even endorse coverage rules or reimbursement for any particular treatment. Medicare may take the Institute’s research into account when deciding what procedures it will cover, so long as the new research is not the sole justification and the agency allows for public input. The bill forbids the Institute to develop or employ “a dollars per quality adjusted life year” (or similar measure that discounts the value of a life because of an individual’s disability) as a threshold to establish what type of health care is cost effective or recommended. This makes it different from the UK’s National Institute for Health and Clinical Excellence. — Creation of task forces on Preventive Services and Community Preventive Services to develop, update, and disseminate evidenced-based recommendations on the use of clinical and community prevention services. — The Indian Health Care Improvement Act is reauthorized and amended. — Chain restaurants and food vendors with 20 or more locations are required to display the caloric content of their foods on menus, drive-through menus, and vending machines. Additional information, such as saturated fat, carbohydrate, and sodium content, must also be made available upon request. But first, the Food and Drug Administration has to come up with regulations, and as a result, calories disclosures may not appear until 2013 or 2014. — States can apply for a ‘State Plan Amendment” to expand family planning eligibility to the same eligibility as pregnancy related care (above and beyond Medicaid level eligibility), through a state option rather than having to apply for a federal waiver. — Adults with existing conditions became eligible to join a temporary high-risk pool, which will be superseded by the health care exchange in 2014. To qualify for coverage, applicants must have a pre-existing health condition and have been uninsured for at least the past six months. There is no age requirement. The new program sets premiums as if for a standard population and not for a population with a higher health risk. Allows premiums to vary by age (4:1), geographic area, and family composition. Limit out-of-pocket spending to $5,950 for individuals and $11,900 for families, excluding premiums. — A 10% sales tax on indoor tanning took effect. — Insurers are prohibited from imposing lifetime dollar limits on essential benefits, like hospital stays, in new policies issued. — Dependents (children) will be permitted to remain on their parents’ insurance plan until their 26th birthday, and regulations implemented under PPACA include dependents that no longer live with their parents, are not a dependent on a parent’s tax return, are no longer a student, or are married. — Insurers are prohibited from excluding pre-existing medical conditions (except in grandfathered individual health insurance plans) for children under the age of 19. — All new insurance plans must cover preventive care and medical screenings rated Level A or B by the U.S. Preventive Services Task Force. Insurers are prohibited from charging co-payments, co-insurance, or deductibles for these services. — Individuals affected by the Medicare Part D coverage gap will receive a $250 rebate, and 50% of the gap will be eliminated in 2011. The gap will be eliminated by 2020. — Insurers’ abilities to enforce annual spending caps will be restricted, and completely prohibited by 2014. — Insurers are prohibited from dropping policyholders when they get sick. — Insurers are required to reveal details about administrative and executive expenditures. — Insurers are required to implement an appeals process for coverage determination and claims on all new plans. — Enhanced methods of fraud detection are implemented. — Medicare is expanded to small, rural hospitals and facilities. — Medicare patients with chronic illnesses must be monitored/evaluated on a 3-month basis for coverage of the medications for treatment of such illnesses. — Companies which provide early retiree benefits for individuals aged 55–64 are eligible to participate in a temporary program which reduces premium costs. — A new website installed by the Secretary of Health and Human Services will provide consumer insurance information for individuals and small businesses in all states. — A temporary credit program is established to encourage private investment in new therapies for disease treatment and prevention. — All new insurance plans must cover childhood immunizations and adult vaccinations recommended by the Advisory Committee on Immunization Practices (ACIP) without charging co-payments, co-insurance, or deductibles when provided by an in-network provider. — Insurers must spend 80% (for individual or small group insurers) or 85% (for large group insurers) of premium dollars on health costs and claims, leaving only 20% or 15% respectively for administrative costs and profits, subject to various waivers and exemptions. If an insurer fails to meet this requirement, there is no penalty, but a rebate must be issued to the policy holder. This policy is known as the ‘Medical Loss Ratio’. — The Centers for Medicare and Medicaid Services is responsible for developing the Center for Medicare and Medicaid Innovation and overseeing the testing of innovative payment and delivery models. — Flexible spending accounts, Health reimbursement accounts and health savings accounts cannot be used to pay for over-the-counter drugs, purchased without a prescription, except insulin. — All health insurance companies must inform the public when they want to increase health insurance rates for individual or small group policies by an average of 10% or more. This policy is known as ‘Rate Review’. States are provided with Health Insurance Rate Review Grants to enhance their rate review programs and bring greater transparency to the process. — Employers must disclose the value of the benefits they provided beginning in 2012 for each employee’s health insurance coverage on the employee’s annual Form W-2’s. This requirement was originally to be effective January 1, 2011, but was postponed by IRS Notice 2010–69 on October 23, 2010. Reporting is not required for any employer that was required to file fewer than 250 Forms W-2 in the preceding calendar year. — New tax reporting changes were to come in effect. Lawmakers originally felt these changes would help prevent tax evasion by corporations. However, in April 2011, Congress passed and President Obama signed the Comprehensive 1099 Taxpayer Protection and Repayment of Exchange Subsidy Overpayments Act of 2011 repealing this provision, because it was burdensome to small businesses. Before PPACA businesses were required to notify the IRS on form 1099 of certain payments to individuals for certain services or property over a reporting threshold of $600. Under the repealed law, reporting of payments to corporations would also be required. Originally it was expected to raise $17 billion over 10 years. The amendments made by Section 9006 of PPACA were designed to apply to payments made by businesses after December 31, 2011, but will no longer apply because of the repeal of the section. — All new plans must cover certain preventive services such as mammograms and colonoscopies without charging a deductible, co-pay or coinsurance. Women’s Preventive Services – including well-woman visits, support for breastfeeding equipment, contraception and domestic violence screening – will be covered without cost sharing. This is also known as the contraceptive mandate. — Beginning January 1, 2013, the limit on pre-tax contributions to flexible spending accounts will be capped at $2,500 per year. — Religious organizations that were given an extra year to implement the contraceptive mandate are no longer exempt. — Insurers are prohibited from discriminating against or charging higher rates for any individuals based on gender or pre-existing medical conditions. — The Individual Mandate kicks in. Either individuals carry mandatory health insurance or they are required to pay a fine (government will be linked directly to the person’s bank account). Obamacare will impose an annual penalty of $95, or up to 1% of income over the filing minimum, whichever is greater, on individuals who are not covered by an acceptable insurance policy; this will rise to a minimum of $695 ($2,085 for families), or 2.5% of income over the filing minimum, by 2016. Exemptions to the mandatory coverage provision and penalty are permitted for religious reasons or for those for whom the least expensive policy would exceed 8% of their income. — Insurers are prohibited from establishing annual spending caps. 2014 – The greater of $95 or 1% of income. 2015 – $325 or 2% of income. As written, PPACA withheld all Medicaid funding from states declining to participate in the expansion. However, the Supreme Court ruled, in National Federation of Independent Business v. Sebelius, that this withdrawal of funding was unconstitutionally coercive, and that individual states had the right to opt out of the Medicaid expansion without losing pre-existing Medicaid funding from the federal government. As of July 10, 2012, the governors of several states: Texas, Florida, Mississippi, Louisiana, South Carolina, New Jersey, and New Hampshire had announced that they would decline to participate in the Medicaid expansion. — Two years of tax credits will be offered to qualified small businesses. In order to receive the full benefit of a 50% premium subsidy, the small business must have an average payroll per full-time equivalent (“FTE”) employee, excluding the owner of the business, of less than $25,000 and have fewer than 11 FTEs. The subsidy is reduced by 6.7% per additional employee and 4% per additional $1,000 of average compensation. As an example, a 16 FTE firm with a $35,000 average salary would be entitled to a 10% premium subsidy. Impose a $2,000 per employee penalty on employers with more than 50 employees who do not offer health insurance to their full-time workers (as amended by the reconciliation bill). — For employer sponsored plans, set a maximum of $2,000 annual deductible for a plan covering a single individual or $4,000 annual deductible for any other plan. These limits can be increased under rules set in section 1302. — The CLASS Act provision would have created a voluntary long-term care insurance program, but in October 2011 the Department of Health and Human Services announced that the provision was unworkable and would be dropped, although an Obama administration official later said the President does not support repealing this provision. — Pay for new spending, in part, through spending and coverage cuts in Medicare Advantage, slowing the growth of Medicare provider payments (in part through the creation of a new Independent Payment Advisory Board), reducing Medicare and Medicaid drug reimbursement rate, cutting other Medicare and Medicaid spending. — Revenue increases from a new $2,500 limit on tax-free contributions to flexible spending accounts (FSAs), which allow for payment of health costs. — Establish health insurance exchanges, and subsidization of insurance premiums for individuals in households with income up to 400% of the poverty line. — CMS begins using the Medicare fee schedule to give larger payments to physicians who provide high-quality care compared with cost. — All existing health insurance plans must cover approved preventive care and checkups without co-payment. — A 40% excise tax on high-cost or high-end (“Cadillac”) insurance plans worth over $27,500 for families ($10,200 for individuals) is introduced. [Dental and vision plans are exempt and will not be counted in the total cost of a family’s plan]. *** Appropriations in Obamacare continue until 2019. 2014; family of 2; taxable income = $26,000; tax = $260; because $260 (= $26,000 x 1%) is higher than $190 (= $95 x 2). 2014; family of 3; taxable income = $26,000; tax = $285; because $285 (= $95 x 3) is higher than $260 (= $26,000 x 1%). 2016; family of 3; taxable income = $26,000; tax = $2,085; because $2,085 (= $695 x 3) is higher than $650 (= $26,000 x 2.5%). 2016; family of 3; taxable income = $85,000; tax = $2,125; because $2,125 (= $85,000 x 2.5%) is higher than $2,085 (= $695 x 3). 2016; family of 8; taxable income = $85,000; tax = $2,125; because $2,125 (= $85,000 x 2.5%) is higher than $2,085 (= $695 x 3). 2016; family of 8; taxable income = $300,000; tax = $7,500; because $7,500 (= $300,000 x 2.5%) is higher than $2,085 (= $695 x 3). Outstanding! This obviously took a great deal of work. Well thought out and written. Thanks! An outstanding piece on Obamacare and why the states should Nullify it. I’d like to make an additional comment on Obamacare. Section 1312 contains a provision specifically for members of Congress. It states that the only plans that the government can provide to them must be sanctioned under the healthcare bill. (I) MEMBER OF CONGRESS.-The term ”Member of Congress” means any member of the House of Representatives or the Senate. (II) CONGRESSIONAL STAFF.-The term ”congressional staff” means all full-time and part-time employees employed by the official office of a Member of Congress, whether in Washington, DC or outside of Washington, DC. On March 22, as the Senate was debating reconciliation on the bill, one of the Senators – Chuck Grassley – tried to insert an amendment into the proposed bill to force members of Congress to be bound by the same provisions that it was forcing on the American people. The reason he did that was because Congress had specifically carved out an exception for themselves in fall of 2009 when they first tried to pass the healthcare bill. During the closed-door negotiations on the bill late that year, the Senate Majority Leader Harry Reid carved out Senate committee and leadership staff from this requirement. Likely there was also a carve-off for members of the House, or there would have been. Grassley (R-Iowa) thought that was an abomination. He said that since they fought so hard for it, it should be bound by it. Also, if it turns out that there are problems with the bill and implementation, they’ll be able to really understand them, as they should, and then be in a better position to fix them. And so the bill that the Senate and then House passed to approve Obamacare included this amendment (Section 1312) to have members of Congress and their staffs get their health insurance through the same health insurance exchanges that would make health plans available for the general public . Prior to this amendment, Congress, the President, the VP, White House staff, cabinet members, etc etc would have been able to get their healthcare insurance and plans from wherever they saw fit. The way I understand it, the Obamacare plan creates a set of 50 state-based insurance “exchanges” that are established as markets for health plans. Once the exchanges are in place, the individual market–the ability to go directly to an insurer and buy a health-care policy–will disappear. You’ll have only two places to buy insurance, in the exchanges or through your workplace. Consumers must buy policies from their employers or through the exchanges, but, either way, their choice of coverage is limited to one of four basic insurance plans that the government sanctions. Private insurers will still compete to offer policies but must model their coverage on one of these four templates. In short, the bill explicitly standardizes health benefits and then establishes elaborate mechanisms (including subsidies and penalties) to pay for them. While these four plans vary from low- to high-cost options, the benefits offered under them are pretty much the same. The difference between the cheaper and pricier plans is mostly the amount of cost sharing (that is, you pay less for insurance if your co-pays are higher). In effect, the plan creates a single national health-insurance policy, with the overriding goal of Obama’s reform being the desire to turn health insurance into a more “egalitarian” benefit that’s the same for everyone, regardless of income, personal preference or need. Consumers’ only real option is to trade higher co-pays for lower premiums. But we’ll all get the same package of benefits established by a series of new agencies and an “insurance czar” seated in Washington (right now it’s Kathleen Sibelius, the same czar pushing to force church organizations to provide the morning-after birth control pill to employees and to take away the “work requirement” from welfare). Like I said, this is the way I understand the healthcare bill. So here is where my skepticism comes in. President Obama and democratic members of Congress worked tirelessly to get this bill passed. Many democrats were “coerced” into voting for the bill. We all remember how, on the week-end of March 21-22, Obama did not have the votes to pass the bill. In fact, thousands of us were in DC at the healthcare rally to protest Congress. While we were there, republican members of Congress would come out from time to time and give us an update on the ‘numbers’ that Obama had, and all day long, he never had enough to pass the bill. Then Obama called a special secret closed-door meeting of House democrats in the Capitol in the early evening(many of us were still up there when that happened) and then magically, after that meeting, there was a consensus of democrats. What did Obama promise? So let’s look at the timing. House democrats finally caved into President Obama. Then reconciliation kicked in and both houses had to agree to the same language and then pass it. The night before it passed and then Obama signed it, the amendment was added to bind members of Congress to the same health plan it sought to impose on the American people. There was no way that Obama was going to allow the fragile consensus he built to erode because of a new provision that threatened their personal interests. And there was no way he was going to allow anymore time to elapse by having the 2 houses of Congress haggle over this new amendment. So, while the amendment is written clearly in the bill, do you not think that there were some assurances given by the White House regarding it in return for their votes? Remember, the bill HAD to be passed before anyone could have the opportunity to read it and digest it. I can’t prove it, but just remember how easily the White House granted waivers to its supporters (like Unions and Nancy Pelosi’s entire district in California)… Granted, the waivers were more temporary in nature, but the fact is that waivers are available and were granted and probably still are granted. Last year when I blogged about members of Congress being addressed in the healthcare bill and being limited to the exchanges or other plan created under law, I got a bunch of responses laughing at me and calling me ‘naive.’ They told me I was living in Disneyland or some alter universe if I truly believed that. They wrote: “Diane, I hope your smarter than that.” I also talked to several doctors and they were convinced that Congress will not be bound by Section 1312, despite what the bill says. Now, what I haven’t been able to confirm is whether members of Congress and other government officials are protected in their current healthcare scheme through the Grandfather Clause of the healthcare bill. This provision allows any employer-based plan that existed on March 23, 2010 or earlier to be grandfathered in (ie, exempt from Obamacare). And get this. To remain protected, these plans cannot increase premiums, deductibles, deny coverage, etc etc. Pingback: Weekly Round Up – Minecraft Edition | What Would The Founders Think?